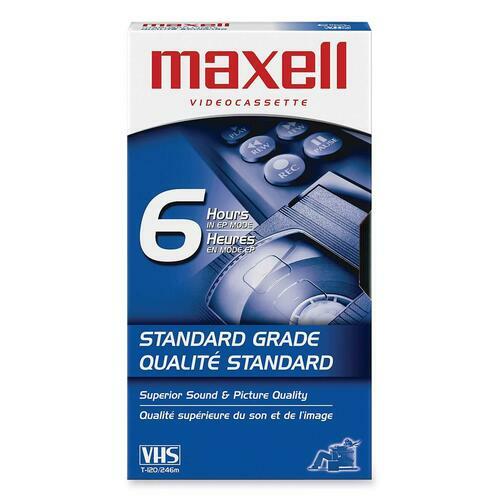 Maxell Standard VHS Videocassette - VHS - 0.05\" - 120Minute - SP, 360Minute - EP - Welcome to TABS! Standard VHS Videocassette provide clear, sharp pictures and bright colors. Great for recording in extended play modes. Standard VHS Videocassette provide clear, sharp pictures and bright colors. Excellent tape durability. Great for recording in extended play modes. SP mode: 2 hours. LP mode: 4 hours. EP mode: 6 hours. Country of Origin: South Korea Depth: 4.3"
Videocassette Technology: VHS Width: 7.5"